Val d’Isere is part of a large ski area called the Espace Killy, named after the world champion skier Jean Claude Killy who lived in Val d’Isere. It shares this ski area with neighbouring resort Tignes, it has over 300km (190 miles) of pistes and is famous for it’s great off piste. With access to some of the most challenging slopes and a wide range of easy runs, Val d'Isere really is attractive to all levels of skier. Due to its altitude the Espace Killy has a very reliable snow record which, according to 'The good Ski & Snowboarding Guide' the "Espace Killy" is one of only two ski areas in France listed as a 'Snow-Sure resorts'. 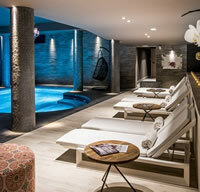 The Espace Killy boasts a fast & efficient lift system 97 lifts including 2 high speed underground trains (funicular railways) one of which transports you from La Daille to the top of the Belvarde and the other takes you up the Grand Motte Glacier. This area is also known for its DC sponsored Park, where you can ride rails, go down the boardercross and jump off the small blues to large black jumps if you are brave enough. To finish it off there is the 1992 Olympics downhill course should you be feeling the need for speed. Val d’Isere is famous firstly for it’s skiing and secondly for it’s nightlife, if you like to party this really is the place to be, with the party starting on the mountain during the day and carrying on into the late hours Val d’Isere really is a great party town with many bars to suite different tastes / budgets. 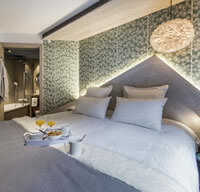 It also boasts many restaurants from your local takeaway to high end 5 star establishments. For when you are not on the piste or in a bar Val d’Isere has many shops from your high end designer outlet to your weekly street market. 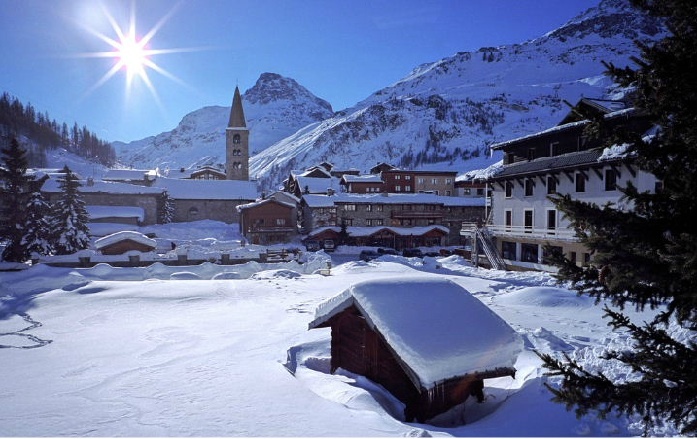 Val d’Isere town is made up of 4 areas Val d’Isere itself, La Daille, Le Fornet and the Manchet Valley. 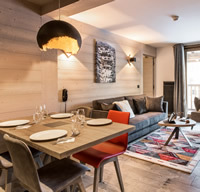 La Daille is slightly out of town but has a free bus service to the centre, because of this is a slightly cheaper place to stay but actually has some of the best access to lifts in the whole area. Being at the bottom or the funicular you can be on the slopes very quickly. Le Fornet is past the main town a few km up the valley, again serviced by the free buses this is out of town but is a very pretty village with some amazing chalets and has great access to the Fornet ski area. This quieter ski area is famous with locals for it’s great tree runs. The Manchet Valley is close in proximity to the main town and again is picture postcard pretty, it has some very beautiful new chalets. Then Val d’Isere itself is where it all happens, all the bars / restaurants / shops this is a very lively resort and attracts people from the rich and famous (We’ve personally seen Richard Branson eating out, Robert Palmer, Karen Millen, and Rick Astley (for those 80’s lovers) we’ve also been told that people have spotted Paul McCartney and Robbie Williams but to name a few) to your everyday boarder. 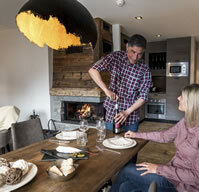 Accommodation – Val d’Isere caters for 30,000 visitors at any one time predominantly in Catered chalets and hotels, although there are a plenty of self catered places to choose from. 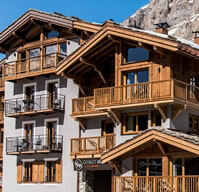 Most accommodation has very convenient access to the slopes.